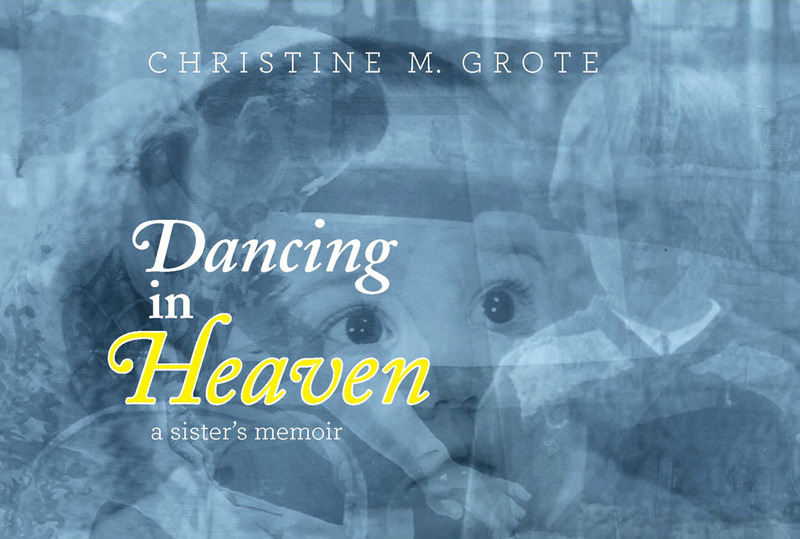 I must admit that I have really let the ball drop on promotional activities for Dancing in Heaven over the past several months. Thank goodness for the journal I keep otherwise I would be completely clueless at this point about where my promotional efforts stand. This is no way to run a business. Reviews and Interviews: In January two interviews and a book review were posted by bloggers. I continued to contact reviewers who blog and sent a few books or coupons for ebooks out. I need to follow-up with some of these. Bookstores: Even though I know bricks and mortar stores don’t stock self-published books, I had reason to believe that B&N might be open to hosting an author event. When I checked with the sales associate, he said they do hold book-signings but I would have to bring my own books. He gave me the name of the person to contact. I was disappointed to find out from her that she could not do it because my books are not “returnable.” This exact same thing happened at the independent bookseller, Joseph Beth. The sales associate gave me hope; the person in charge dashed it, even after I explained that I would deliver the books and they were returnable to me. I delivered 16 books to the bookstore at the College of Mount St. Joseph to be sold on consignment. This is a required text for Prof. Jeff Hillard’s “Cincinnati Authors” class that I will be speaking at in April. Jeff has been a tremendous supporter. Marketing Materials: I continue to lag behind on putting together a one-sheet. This would be helpful to have to send out to places I would like to contact about my book. I hope I can get motivated to do this soon. 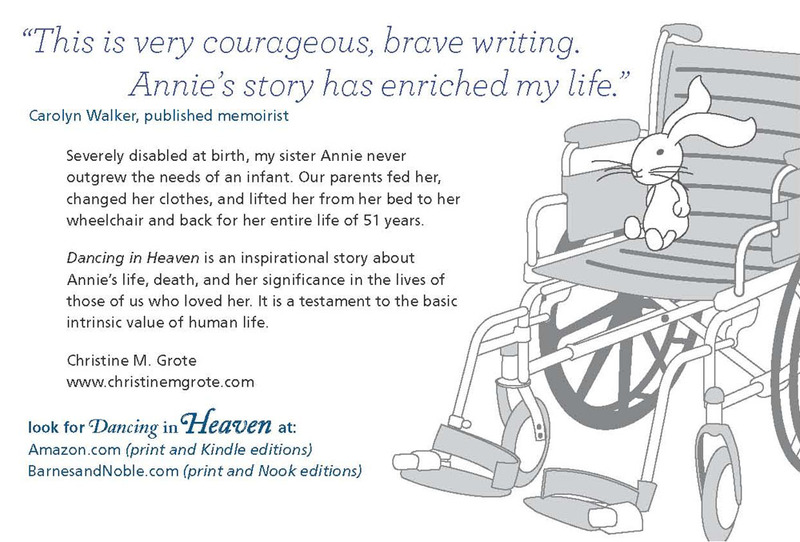 I did manage to put together a little postcard for Dancing in Heaven. The postcard paper I got from Office Depot is disappointingly thin. I may look into buying heavier card stock or pricing having someone else print them. I’m really trying to keep down the costs of promotion. Contests: I entered the National Indie Excellence Awards contest. Winners will be announced in May. I’m hoping for an honorable mention of some sort to be able to use in my promotional efforts. I may not have mentioned that in November I entered the Writer’s Digest Self-Publishing contest. I don’t think I’ll hear anything from that until October. Miscellaneous: I think I mentioned that a friend gave my book to the person in charge of the Resource Room at a local children’s hospital where they will provide purchase information to anyone who wants to buy it. Another friend gave a copy to nurse from Toledo who plans to take it to her hospital’s Resource Room. This may be another good avenue to pursue with time. When the dust settles from Mark’s surgery and recovery, I hope to go back through all my posts and harvest the suggestions you generous readers have offered and then make a detailed plan with goals. This step is long overdue. I know there are organizations I want to contact about Dancing in Heaven. And many things I can be doing to promote this memoir. I have to decide for myself how much time and effort I am willing to commit and then start doing it. I need to learn more and think about the KDP Select program where your book becomes part of a Kindle library and it can be borrowed for free, but you get some percentage of the fund. This program requires an exclusivity that concerns me. I cannot have my book available on other e-formats for some period of time. The other formats haven’t really sold very many of my books, but something about this bothers me. I need to find out more about it. My sales for January are lower, as would be expected considering my lack of promotional activities. In fact, sometimes I wonder how I am selling any books at all. Who is buying them? How did they learn about Dancing in Heaven? I see now that I need to be the motor behind getting the book out there so that people who are interested will know of it. I love reading your updates, Christine — and I’m so glad you post them. It’s so helpful to follow the journey of self published authors as I finish up this WIP and decide the direction I’ll be taking! (and I’m glad you posted about something other than Mark — not that those posts weren’t interesting!– I think it means your life is getting back to normal?! I’ve been debating whether or not to throw in the towel. I’m not sure how inspirational these lack-luster updates are for anyone. I knew from the beginning that promotion was the make-it or break-it place. I understand first-hand about that now. You would do fine, probably. You have been very successful at building your online platform and contacts. Plus you have previous freelance experience and know some of the ropes. I know I can learn. I just have to find the will to do it. Yes, I think we’re on a coast level with Mark’s knees right now. I can’t say that my life is back to normal, but I have a little breathing room. Maybe you could cut yourself some extra slack this month, given Mark’s surgery. It’s hard to focus on selling books when nearly all of your efforts go to nursing. Hang in there, my friend! 1. You wrote a book. 2. You edited it when you couldn’t get necessary releases. 3. You published it in both print and Kindle editions. 4. You’ve sold an average of one book a day since publication. And thanks for your perspective. It lifts me up. Your transparency amazes me and gives me courage to continue. Sometimes I wonder about it. But I think it is only fair to those people who have watched my journey to continue. I know people could do better at sales than I am, but I also think some people go into it thinking it’s not that hard. You and I both know different now, don’t we? The book is still selling, even with minimal input from you. 🙂 You will find the right channels to get your book into the proper hands, when the time is right. Thank you, Patti. That is exactly what I am hoping for. You are doing well in the world of print-on-demand. The return factor is huge, and that’s why consignment is usually the way to go. Re Barnes and Noble: We found that the way to have a successful signing there was to get a group to “sponsor” us, meaning to have their members promote the signing and show up. If you have a big turnout, the store will agree to carry a small number of books for a very short time. Thanks for commenting. I value your experience. Unfortunately, first I have to find and contact my “group.” I’m not sure that being in a store really makes a big difference to me. I never asked if they took books on consignment, so that is an avenue I may pursue in the future. Given what’s been going on with Mark, you can cut yourself some slack for the moment, and regroup after he’s improving more. Thanks, William. I don’t think you realize what a support you are to me.